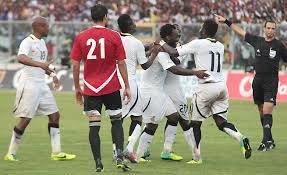 Will Ghana Make It Without Asamoah Gyan? Asamoah Gyan, the all time goal scorer of Ghana National team, has represented Ghana in three world cup 2006, 2010 and 2014 World cup emerging as Africa’s highest goal scorer with 6 goals in the history of World cup. Gyan has appeared in 7 Africa cup of nations year 2006, 2008, 2010, 2012, 2013, 2015 and 2017 helping them finish in third place in 2008, runner up in 2010 and 2015 .Obviously he is indispensable to Ghana National team. Yesterday 25th of January 2017, Ghana played Egypt in the qualifications round to emerge to the quarter final round and Egypt came in top as group leaders after defeating Ghana 1-0. Mohammed Sallah lashed in a free kick to give Egypt the upper hand. Asamoah Gyan got a kick to the groin and was substituted, but the question that seem to be on everyone’s lip is what will become of Ghana if Asamoah Gyan doesn’t recover in time? will they make it? well time will tell.